Lieb Family Cellars is toasting spring's arrival with OysterFest throughout April. Every Saturday in April, from 1 p.m. to 4 p.m., you'll be able to sample Lieb's wines and delicious oyster dishes prepared by local chefs. They are offering a liberal tasting of three vintages of Lieb's popular Pinot Blanc, including its Blanc de Blanc sparkling wine, and will also serve its newly-released Cabernet Franc, a seafood-friendly red wine. The wines will be paired with tasty oysters and seafood dishes from local establishments, including Della Femina Restaurant in East Hampton, Waterside Caterers of Northport, Brewster's Seafood Market in Hampton Bays and Red Door Restaurant in Mattituck. The cost is $15. For more information, call (631) 734-1100. Every week, I get emails asking for advice on which wineries to visit or wondering which local wines I’m really enjoying that week. Truthfully, I always find these emails hard to answer because wine tastes are so individual and personal. My tastes may, and probably are, different from yours. So, every time my wife and I visit wine country, we try to take a different path so that we taste different wines and meet different people. But what’s a “typical” winery jaunt? Last Saturday, we started at Roanoke Vineyards, where we enjoyed chatting with owner Rich Pisacano and sampling his 2003 reds, which were impressive and invitingly complex. Right now, my favorite is the elegant, aromatic, Cabernet Franc-dominated Blend Two ($36) but his Cabernet Sauvignon ($40) and Cabernet Sauvignon-dominated Blend One ($30) have excellent potential as well. Made by Roman Roth of Wolffer Estate, where Rich is vineyard manager, these wines are drinking well now, but will reward those patient enough to cellar them for another 3-7 years. It was lunchtime by the time we left Roanoke, and we decided against Farmer Bar (4805 Depot Lane, Cutchogue), our favorite spot for a casual lunch of barbecue, sweet potato fries and fried green tomatoes. 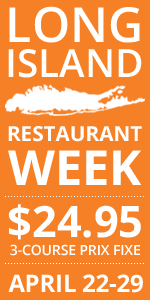 Instead, we stopped in at the Piping Plover Cafe & Gourmet Market (53345 Main Road, Southold) for a quick bite. We waited half an hour for two cups of soup and two salads, but my Thai beef salad with sweet chili vinaigrette was delicious and I like any place that uses un-ground beef in its chili. Severely under-ripe tomatoes detracted from our salads, however and should have just been left out. Properly satiated, we stopped in at Bedell Cellars and its sister tasting room at Corey Creek Vineyards next. The wines were good across the board, as I’ve come to expect from the Bedell team, and I was extremely happy to taste the Bedell Cellars 2001 Reserve Merlot ($30) and Bedell Cellars 2001 Cupola ($30) again. Along with Corey Creek’s gewurtz, they highlighted that leg of our tour. Heading back up to Route 48, we tasted some delectable olive oil in the foyer at Castello di Borghese before heading into the tasting room. Castello di Borghese’s 2002 Reserve Pinot Noir ($35) is still among the best local renditions, with supreme balance. I also got my first taste of their Hamptons-priced 2001 Private Reserve ($195 per 1.5L magnum). A refined, nuanced and pretty wine, I only wish it were even remotely affordable. 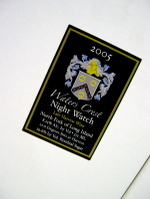 To end our early spring Saturday enjoying the North Fork, we attended a launch party at Waters Crest Winery for Waters Crest Winery 2004 Night Watch ($45), a luscious dessert wine made with frozen Gewürztraminer, Riesling and Chardonnay grapes. It is named “Night Watch” because winemaker Jim Waters did just that — watched it all day and night for four full days (without sleep). He’s since recovered from sleep deprivation and the fruit of his labor is a rich, intricate dessert wine that is sweet, but with just the right acidity to keep it from being heavy. Coincidentally, the party was catered by the Piping Plover Café, and the duck quesadillas were outstanding — especially with Jim’s 2003 Cabernet Franc ($30). Announcement: 50 States. 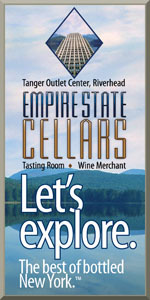 50 Wineries. 50 Weeks. Here on LENNDEVOURS, I bring you, my devoted (I hope) readers, the best of what New York's wine regions have to offer, but as a weekly contributor to Wine Sediments, I've expanded that scope inThe Vines Less Tasted, a weekly column that focuses on lesser-known regions and lesser-known grapes. With wine being produced in every state of the union, there are so many wines out there beyond those made in California, Oregon, Washington and, yes, New York. I don't even need to leave our shores for material. 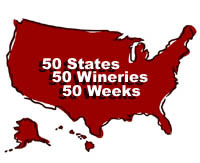 So, it is with great pleasure and excitement that I annouce that I will taste, and write about, wines from all 50 states over the next 50 weeks. Of course, as fun as I think this project will be, it is not one without potential challenges. How will I know which wines capture the essence of any given state? Will I be able to find wines made from fruit grown in every state? I think that's important. And most daunting of all -- will I be able to navigate our country's ever-changing interstate shipping laws? No matter what, you can count on me to bring the wines of the U.S. into your office, home office, living room, kitchen...wherever your computer may be. There should be a lot of interesting and unique wines featured. I mean, who wouldn't want to try, at least once, a wine made from freshly harvested pineapple? Keep an eye on Wine Sediments. The 50 States - 50 Weeks event kicks off the first week of May. That will give me a few weeks to get some of the logistical issues resolved. In the mean time, if you know of a meticulous muscadine producer in Alabama, a maker of brilliant baco noir in Wisconsin or any other wine in any other state that I should target let me know. Saturday night, Nena and I enjoyed what I would term, without reservation, the best meal we've ever eaten at a restaurant. 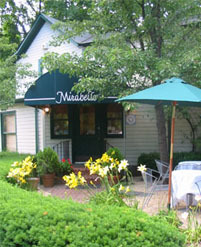 A bold statement to be sure, but Mirabelle in St. James is deserving of this and any other praise it receives. Wanting to spoil ourselves a bit, Nena and I decided to enjoy their eight-course tasting menu, which is a steal at $80. The captain and chef were both very accomodating when I explained my shellfish allergy and seafood aversion and they happily substituted two fo the eight dishes for me. For her first course, Nena had a trio of scallops, which included a seared scallop with pickled papaya, scallop mousse with soy sauce, and scallop ceviche with frisee. She loved the seared scallop and liked the ceviche well enough, but thought that the soy-based sauce overpowered the mousse. My first course was grilled asparagus salad with quail egg, frisee and dijon vinaigrette. Light and flavorful, it was a nice opening to my meal. Fatemeh, everyone's favorite, often-travelling food writer (and owner of Gastronomie) finally found a few spare minutes in her busy schedule to post about the fun she and C had when they explored Long Island wine country a bit with me a while back. F&C were a lot of fun to taste with and I definitely hope this was just the first of many culinary jaunts together, starting with my still-on trip to the Bay Area at the end of June. You all know that I think Long Island wines have a lot to offer, but don't just take my word for it. Fatemeh, Beau and Derrick have tasted them too. I bought Nena tickets to Coldplay at Nassau Coliseum for Xmas and while there was wine available, who wants to drink Beringer from small plastic screwcap bottles? Not me. Nena even drank beer instead, which never happens. Richard Ashcroft (front man for the Verve) opened the show and was pretty good. I would have liked it better had he not finished his set with the Verve's Bittersweet Symphony. I'm not a big fan of that song at all. I'm no music critic and this was only the second concert I've ever been to, but the show was really really good. I like Coldplay, but wondered how their sometimes lullabye-esque music would translate live. Awesome. It was harder and louder (two things I like in music) than I expected. Great show. Great entertainers...and actually talented. Ever had a wine from Napa Valley? Yes, you have. Ever tasted a Gamay Noir (as in a Beaujolais)? Yeah you probably have...but have you tasted a Gamay Noir from the Napa Valley? I have...check out my post this week on Wine Sediments. Late last summer, I got my first taste of Vineyard 48’s first new wines(as opposed to the old Bidwell stock they sold under their label), all not-yet-released whites from the 2004 vintage. The best of the lot was a nicely balanced semi-dry Riesling, but the others seemed either taut and un-yielding, or a disjointed. A little over six months later, I decided to re-taste a few of the whites along with three newly released 2004 reds — and there is reason to keep an eye on Vineyard 48. The first of the re-tasted whites, Vineyard 48 2004 Sauvignon Blanc ($14) has a lean nose dominated by grapefruit and lemon zest accented by typical grassiness. It is medium bodied with lemony-citrus flavors and just a touch of minerality. Some of the acidity has faded in the half year since I last tasted it, but it’s still a pleasant, if simple, dry white. The Vineyard 48 2004 Chardonnay ($15) is fresh and fruity on the nose, offering pear, peach and faint toasty notes. The palate begins with a luscious burst of juicy ripe apple and slightly tropical flavors with a little crisp acidity, with obvious oak aging bringing some toasted oak flavors towards the finish. I could do without the oak, but it’s not offensive or overdone. Perhaps the most un-balanced wine of my initial tasting was Vineyard 48’s 2004 Reserve Chardonnay ($30). But, the wine has definitely developed with a little bottle aging. Satisfying toasted almonds and grilled pineapple have replaced heavy vanilla and oak aromas, and while oak influence is still substantial, it seems softer and creamier on the palate. The pineapples carry over from the nose and are accented by toasted marshmallows and a long, somewhat crisp finish. Six months ago, I thought the thirty-dollar price tag was a little preposterous, but this wine is starting to come around. I think I like this one. I love the rich and often pretty aromatics that the Cabernet Franc grape can offer, and Vineyard 48’s 2004 Cabernet Franc ($28) is no different. Beautiful strawberry, red raspberry and anise aromas waft up out of the glass. Unfortunately, the palate isn’t quite as elegant and lovely. The fore palate is aggressive with charred oak and tannins that give way to nice berry flavors and eventually a fine, lengthy finish. 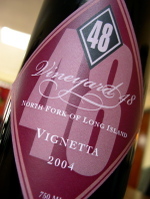 The star of the reds is the Vineyard 48 2004 Vignetta ($25), which is much more approachable and elegant. The nose is complex, mingling tart cherry, cranberry and leather aromas with cinnamon stick and earth dried leaves. Plummy fruit flavors greet the palate with soft, fine oak and tannins and excellent earthiness. This Bordeaux-style blend of fifty-percent Cabernet Franc, thirty-percent Cabernet Sauvignon and twenty-percent Merlot was my favorite wine of this entire tasting. While many wineries are just now releasing 2002 Merlots, Vineyard 48 has released its 2004 Reserve Merlot ($35) and its youth is hard to miss. Extremely tightly wound, it takes time to coax anything but the faintest aromas of blueberries and earthy damp soil from the wine. The palate is similarly reserved, but does display refined tannins that are ripe and well incorporated. Right now there are just some dusty, earthy flavors and little fruit. I think this wine warrants tasting again in a year or two. Vineyard 48's 2004 Vignetta ($25) -- a blend of 50% cabernet franc, 38% cabernet sauvignon and 20% merlot is the stand out among their 2004 reds. Much more approachable and elegant than either their 2004 reserve merlot or 2004 cabernet franc, it's drinking very well despite its relative youth. The nose is complex, mingling tart cherry, cranberry and leather aromas with cinnamon stick and earthy dried leaves. Plummy fruit flavors greet the palate with soft, fine oak and tannins along with excellent earthy character. As I mentioned last week, I put together a wine dinner at Red Barn B&B with several wine-loving friends, including one of the Wine Chicks, a Wine Goddess and a local winemaker. Our hosts, Jim and Linda Slezak, were beyond gracious and warm. From the moment we arrived the when we stepped out the door we all had a great time. I'd highly recommend their B&B to anyone and intend to do so. What Did We Learn at Lenz? As many of you know, last weekend I had the unique chance to blind taste several wines from The Lenz Winery against great (and much more expensive) wines from Burgundy and Bordeaux at an event held for Lenz wine club members. Lenz is well known for using blind tasting such as this one to advance its standing in the overall wine market. 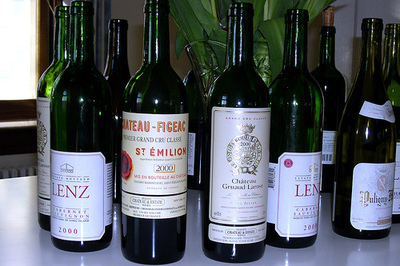 In a 1989 tasting against French heavyweights like La Grande Dame, Chateau Petrus, J. Drouhin, Montrachet Marquis de Laguiche, and Veuve Clicquot tasters were unable to single out the Lenz wines as inferior in quality. Saturday’s tasting wasn’t nearly as ambitious. Chateau Petrus is insanely expensive and buying it for 25 people would have pushed the $50 per person event fee to “$400 or $500” according to winery owner Peter Carroll. He seemed open to holding such an even, however, if people were interested. The first flight, dedicated to crisper-style chardonnay, pitted Lenz Winery 2003 White Label Chardonnay ($12) against 2003 Jean Louis Chevy, Puligny-Montrachet ($35). Tasted blind, I chose the Lenz as my favorite because of its nearly flawless balance. By comparison, the Jean Louis Chevy seemed tight, lean and flat. Flight number two featured Lenz Winery 2001 Silver Label Chardonnay ($15) and 2001 Domain Leflaive Clavoillons, Puligny-Montrachet ($80). Again, I preferred the Lenz wine, by a narrow margin, which again seemed much more balanced while the Burgundy was a little raw in the oak department and lacking fruit. It is worth noting, however that both chardonnay flights were served a bit too cold. Over-chilled Chardonnay is a pet peeve of mine. Our next flight featured two cabernet sauvignon-dominated bottlings, Lenz Winery 2000 Cabernet Sauvignon ($30) and 2000 Gruaud-Larose, St. Julien ($115). 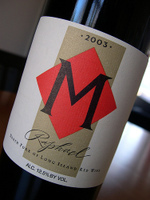 The Lenz was complex, with intense berries, toasty-sweet spices and was almost meaty, with ripe tannins. Very approachable, I thought it was drinking much better than the Gruaud-Larose, which was a bit restrained and high in tannins. Five to ten years from now, when it’s peaking, I expect that I’d prefer it to the Lenz, however. The last flight of the afternoon put Lenz 2000 Estate Selection Merlot ($23) up against 2000 Figeac, St. Emilion ($105) and 2000 Le Bon Pasteur, Pomerol ($110) in a supposed “Merlot Flight.” Only 30-percent Merlot (with 35-percent Cabernet Franc and 35-percent Cabernet Sauvignon) the Figeac seemed out of place, while the Le Bon Pasteur seemed a bit “off” to me and it may have been slightly corked. It was complex, smoky but extremely tannic and obviously not peaking. Again, the Lenz wine won me over as the most ready to drink today. The room was a little dark and the flights were rather rushed, but what did we learn? Never assume that a $100 wine is going to taste better than a $15 bottle — especially when the $100 bottle is a still-young Bordeaux. With substantial tannins, it really wasn’t fair to compare them to the Long Island wines, which are ready now. We also learned that while Merlot still rules Long Island, our Chardonnay is a real bargain — especially the $12 White Label from Lenz. As Fry put it, “The definition of a good wine is that you like it,” which means that, for me Lenz Winery makes good wine. Tonight isn't a night for wine, so I think I'll be drinking more than my share of Guiness, Smithwick's and also some locally produced brews from Southampton Publick House. Nah, I wouldn't do that. At least not before drinking all that beer. What an awesome weekend I have coming up. Sunday morning, I'm holding a rose tasting panel at Pellegrini Vineyards' to explore the different styles of rose/pink/blush wine being crafted here on Long Island. Joining me on the tasting panel will be both Wine Chicks, Dr. Vino, the Wine Goddess and John, currently of Pellegrini Vineyards and soon-to-be head winemaker at Shinn Estate Vineyeyards. Right now I've assembled almost twenty wines for us to try. We won't be grading or rating the wines. Instead, we'll explore their differences and try to identify similarities (if there are any). The other exciting part of the weekend is that most of us, along with significant others, will be dining together Saturday night at Red Barn Bed & Breakfast, where co-owner and chef Linda Slezak is putting together a four course feast for us and we'll be doing our own wine pairing. Should be a lot of fun. Stay tuned for more next week. Eric Asimov, chief wine critic of the New York Times has made the leap into wine blogging with a blog titled The Pour. I've always respected Eric's writing and his knowledge of both wine and food (even if I don't always agree with what he has to say) and I think it lends credence to the power of blogs that people like Eric are joining the fray. How is this going to change wine blogging as a whole? I think that remains to be seen, but I think that bloggers who want to make a name for themselves will most certainly have to up their games. Eric writes for a living (giving him more time to devote to it) and has access to resources that most of us can only dream of. That's a big leg up I think. Plus, he's a damn good writer. But at the same time, is "blogging" just about posting on a blog or is it more? I think it's more...it's interacting with the blog community, responding to comments, and engaging in email discussions with readers and fellow bloggers. Is that going to happen with The Pour? Again, that remains to be seen, but seeing that his most recent post has 95 comments on it...how can anyone possibly keep up? Welcome to the wine blogging world, Mr. Asimov. This should be fun. My first post for the WellFed Network's new wine blog, Wine Sediments, was published this morning. It probably won't surprise any of you that my column is going to highlight lesser-known wine regions and grape varieties. It's name? The Vines Less Tasted. Look for it every Thursday. Read this week's edition: 'Berger or Blau, It's Made for Food -- And How. Three of the Finger Lakes' most respected wineries, Anthony Road Wine Co., Fox Run Vineyards and Red Newt Wine Cellars are jointly launching a dry Riesling named Tierce (a reference to the wine's theme of three). Tierce will be released at a dinner at Red Newt on May 5. I'm hoping to find some way to get there for it. I really like the label and get this -- they've used a screw cap on it. 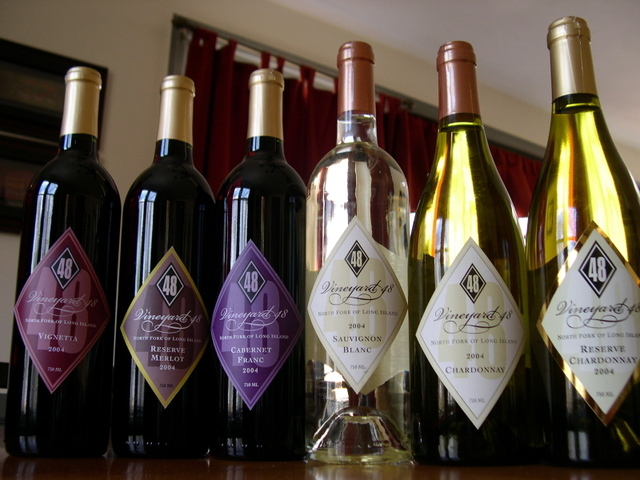 "Welcome to LENNDEVOURS...my new food- and wine-related blog. Here you'll find stories and news on my adventures in the culinary world, including restaurant reviews, wine reviews, commentary on food trends, tales of my fun serving as a recipe tester for various outlets and anything else that comes to mind. My goal is to eventually make money (maybe even a living) as a food writer...and this is just the first step toward making that goal happen." Two years ago today, the above was written as the first-ever post on LENNDEVOURS. 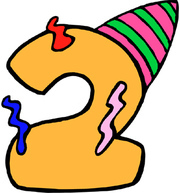 That's right folks, LENNDEVOURS turns two today. It's hard to believe that it's only been two years, and it's hard to believe that it's been two years already. Looking back, this has been quite a fun ride. Back in those days, I knew next-to-nothing about wine and never would have imagined that I'd spend more than $15 on a bottle of wine. Now, I feel like I rarely spend less than that. 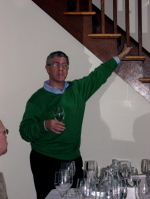 LENNDEVOURS has opened a lot of doors for me, including my various print writing gigs and my recent appointment as the Long Island regional correspondent for Appellation America. I wouldn't say that I'm anywhere near making food/wine writing my full-time profession, but I'm working on it bit by bit. Even if this blog hadn't opened the doors that it has, it wouldn't matter. I've met so many great people (both in person and virtually) because of this blog that I wish I would have started years earlier. I've had the pleasure of meeting Derrick, Beau and Fatemeh in person and I've emailed with many of you over the years as well. Spending time with people who share my passion for fine food and wine is always a pleasure, but it's definitely something special to meet a fellow blogger. It's hard to explain to someone who hasn't experienced it...but there is a closeness and a comfort level that you feel even before you shake hands for the first time. It's a bit like meeting a long-lost friend for the first time. Our blogs are a window into our lives and our personalities and you're bound to feel friendship, even for someone you haven't met, if you peer in that window often enough. Wine Blogging Wednesday, my little baby blog event, has really grown up. April 12th marks it's 20th edition, and it's hard to believe that I launched the event just four months into blogging. I could go on and on in this post, but I never want to bore you guys. So thank you, kind readers, for your support these past 24 months. I hope that you enjoy reading LENNDEVOURS more and more every day and please know that I'm always trying to find ways to improve it and bring you more and more interesting information. I look forward to meeting many more of you in the future. I've been a bit lazy in planning any sort of celebration for this birthday of sorts, but if you're a local reader/blogger and might be interested in getting together in Long Island wine country for a little party, please let me know. If there's enough interest, I'll make it happen. Recently, The Modern, the Museum of Modern Art’s (MoMA) fine dining restaurant started pouring “M” as its house red. Every restaurant has a house red, so what’s the big deal? Well, The Modern boasts a wine list of over 900 wines, but instead of choosing a wine from France or California as its house red, it stayed much closer to home -- the North Fork of Long Island. Richard Olsen-Harbich, winemaker at Raphael in Peconic, and Stephane Colling, wine director at The Modern, developed “M,” a custom blend of 95% merlot and 5% Malbec from the 2003 vintage. By the glass, “M” sells for $11 and it is $40 per bottle. But, do diners at The Modern turn up their nose at this Long Island wine? “Many are surprised but what is important is what they have in the glass. I sometimes just blind taste them, listen to them and ‘teach’ them a little bit. I don’t like pre-conceived ideas,” he commented. In fact, “M” is now his second most ordered wine by the glass. In describing the wine to customers, Colling uses “Old World” and told me, “I compare the wine to the right bank of Bordeaux between Pomerol and St Emilion.” High praise indeed, but after tasting the wine myself, not as crazy as it might sound. The wine is dark crimson with a nice balance between dark berry fruit and toasty-smoky aromas on the nose. The soft, somewhat fruity palate is dominated by merlot, but the 5% malbec is what makes this wine special and reminiscent of Bordeaux. It brings complexity with earthy, tobacco and smoky notes. The tannins are gently gripping on the finish and it’s easy to see this wine along side a wide array of dishes. There are two important things I look for in any house wine — affordability and versatility — and this wine fits the bill. Merlot rules Long Island wine country. It's the most planted variety and its quality led to the creation of the Long Island Merlot Alliance. But it’s hard to ignore the many great varietal cabernet francs being grown and made here as well. Pellegrini Vineyards does a particularly great job with this lesser-known Bordeaux varietal. Thei 2001 Cabernet Franc ($18) has an extremely expressive nose (typical of the variety) that fills the air with raspberry, black cherry and sweet spice. Juicy with some acidity and low tannins, the palate is ripe with raspberries accented by white pepper and minty-basil notes. I enjoy it with Greek and Italian food, including the fusilli with sausage, artichokes and sun-dried tomatoes that my mother in-law cooked for us Friday night. I'm happy to report that the annoucement for Wine Blogging Wednesday #20 has been posted over at April's host, Bill of Wine for Newbies. As the weather warms, many wine drinkers turn to more and more white wines, seeking out more refreshing, palate-cleansing wines. That's all well and good, but Bill wants us to think outside the barrel a bit. So, for this vintage of Wine Blogging Wednesday, you can drink any white wine that you want...it just can't be chardonnay, sauvignon blanc or riesling. Happily, this means that I can make a return to the wines of New York. I'm already considering my many options, including vinifera varieties like gewurtztraminer, pinot blanc and viognier and hybrids from the Finger Lakes like vidal blanc or seyval blanc. Join us on April 12 and spread the word. Thanks to Tom over at Fermentation, I was turned on to a newish wine blog that I'm really enjoying reading -- Good Grape. The talented writer behind Good Grape is a sales and marketing person by day who loves small wine producers. Sound familiar? Read the blog -- you'll be glad that you did. I'm particularly a fan of the Cluetrain Mainfesto. ...I only wish he could proofread for me. Last Saturday was the Lenz Winery Comparitive Blind Tasting I posted about a few weeks ago. All in all, I had a great time at the event. I don't think I've ever been to or held a blind tasting where I didn't learn something...and this one was no different. Look for a complete write-up here soon, but in the meantime, I thought I'd mention some highlights of the day and post some pictures. Before the tasting even started, I was caught off guard when I met a LENNDEVOURS reader for the first time. I was checking in for the event and Rick was sitting nearby. He simply asked and "Are you Lenn? I read your blog." It was the first time I'd met a reader that way. Unfortunately, the tasting was assigned seating and I didn't get to spend much more time with him and his wife. Another highlight was the fact that I was able to identify three of the four Lenz wines in the blind tasting...and I preferred them to the French wines they were tasted against. To be fair, I preferred them largely because they were much more approachable now while the white Burgundies and red Bordeaux were probably a bit young, especially the reds. The tasting was also an interesting opportunity to hear from winery owner, Peter Carroll (pictured right), winemaker Eric Fry and vineyard manager Sam McCullough. Anyone who knows Eric won't be surprised to hear that he dominated most conversations, but that's part of what makes him so fun to taste with. For instance, when someone asked why "legs" are considered important in a wine tasting, he blamed California winemakers and marketeers "Legs are a sign of alcohol. 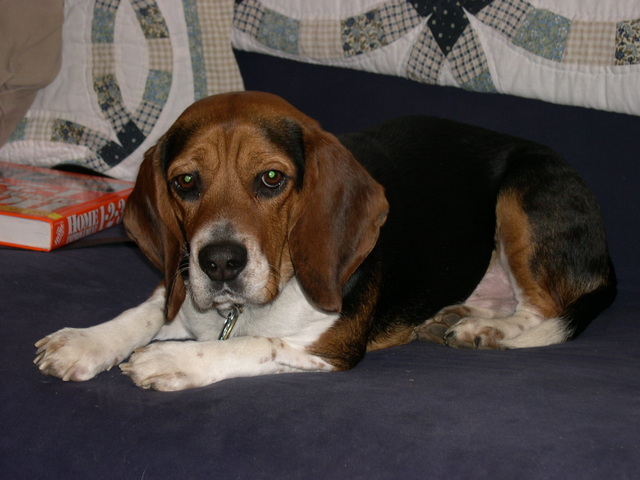 And our friends in California make high alcohol wines, so they created this myth that long legs equal quality." All in all, it was a fun event, though I thought the white wines were served a bit too cold and the flights were definitely rushed. I like to spend much more time with each wine. I'm a couple days behind (it's been up for a couple days) but the Wine Blogging Wednesday #19 - When in Rhone roundup has been posted by our enthusiastic host, Jathan of Winexpression. This even just keeps getting better and better, with new bloggers joining the fun every month. I'm still sorting out April's even with the host...but keep an eye out for the annoucement this week. I just found out this morning that not only has John gotten engaged recently, but he's also been hired by Shinn Estate Vineyards as head winemaker. He'll be staying on at Pellegrini through most of the summer, but will also be transitioning to Shinn. This is great news for both John and for Shinn Estate's owners, David Page and Barbara Shinn. You've no doubt seen me mention John several times here on LENNDEVOURS in recent months. We share a love for this region and a desire to bring wine down off of it's high horse and into the lives and glasses of the masses, not just the elite. He's going to have great fruit to work with at Shinn, so I look forward to tasting his wines going forward.